With the advent and continued development of the personal computer the field of digital communications has opened up. The PC has allowed the operator to replace a lot of other equipment with a software package. Two very good examples are RTTY and SSTV, both of these modes in the past have required the use of large cumbersome and, in the case of RTTY, noisy equipment. Now everything can be done by software allowing everyone access to RTTY and SSTV. 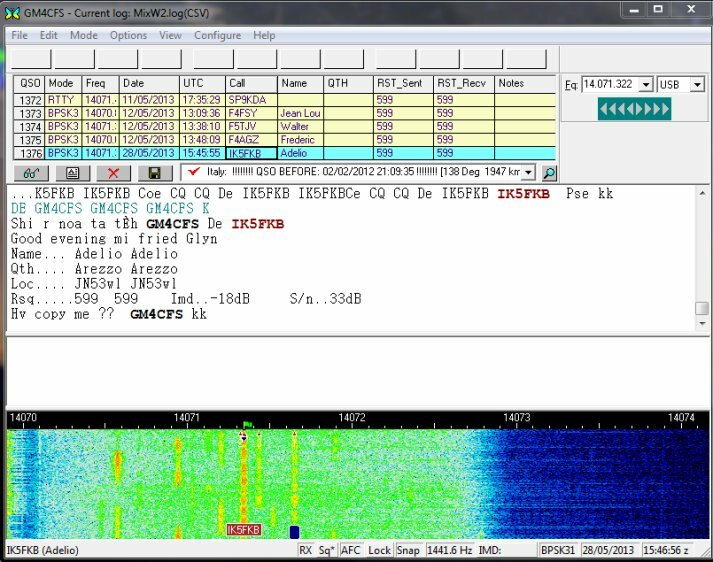 SSTV is covered in a different section but RTTY will be discussed below. There are numerous different digital communications systems available now but the one I use regularly is an adaptation of the amazing suite of weak signal digital modes invented by Joe Taylor K1JT,- JT65HF. JT65HF was written by W4CQZ for extreme weak signal communications and is very resistant to noise and interference. Communication is possible at signal levels in excess of 26db below that needed for SSB communication. Below is a screen print from a QSO with RK6CI. 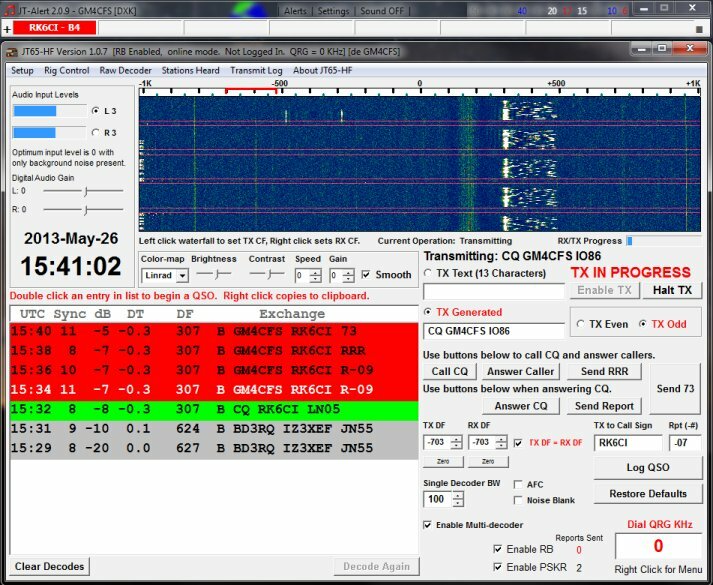 See above JT65 window is JT Alert a direct interface between JT65HF and my logging software DX Keeper. One of the most popular digital modes is PSK31. Based on a idea by SP9VRC and developed by G3PLX this mode uses Phase Shift Keying PSK rather than the traditional Frequency Shift Keying FSK. It uses an alphabet similar to Morse which gives a text speed of approximately 50 wpm. Since the bandwidth is equal to the baud rate and the chosen baud rate is 31.25 we can use a bandwidth of 31Hz and narrow CW filters. It can work at much lower signal levels in a crowded digital band so is therefore suitable for QRP operations. There are numerous different software’s available to use with PSK31 but the one I prefer is MixW developed by UT2UZ as shown below.